This bench offers roomy hat and glove storage under the flip-up seat and boot space down below. 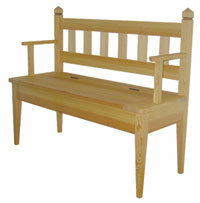 Shown here in douglas fir, it is also available in cherry, curly maple or painted poplar. 43" x 17" x 36"H.